Do you ever wonder how much energy your appliances or electronics use? Now you can cut down on costs and find out what appliances are actually worth keeping plugged in. Simply connect these appliances to the Kill-A-Watt and it will assess how efficient they really are. The large LCD display will count consumption by the kilowatt-hour. 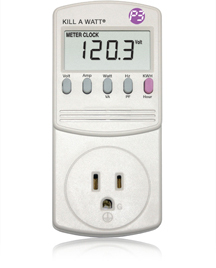 You can calculate your electrical expenses by the day, week, month, even an entire year. Now you´ll know if it is time for a new refrigerator or if that old air conditioner is still saving you money. With the amazing Kill-A-Watt, you´ll know "watts" killing you! A $25 deposit is required and is refunded when the unit is returned. If you wish to borrow one, stop by the office and pick one up.